Every single year when Asa’s birthday rolls around, my sister-in-law Kari lovingly shoots me this message, “You don’t look old enough to have a ___ year old!” This obviously moves her SIL ranking up significantly, and I will watch for these yearly messages every June from now until forever. Aww, shucks. Do you really mean it? This is the amazing man that gave me the name “Mom” 20 years ago today. Asa John, my firstborn. Twenty years. Four sons. The significance of what this 20-year journey has been and continues to be lands me in a place of wonderment. Sure, part of that awe results from the fact that my kids are all huge 6-foot something people and I’m way down here in the 5’s. But much of what I’m treasuring in my heart goes far beyond their physical growth during these two decades. Without knowing it, Asa is the one who taught me to pray. I learned how to pray. It’s the kind of prayer that says, “I believe. 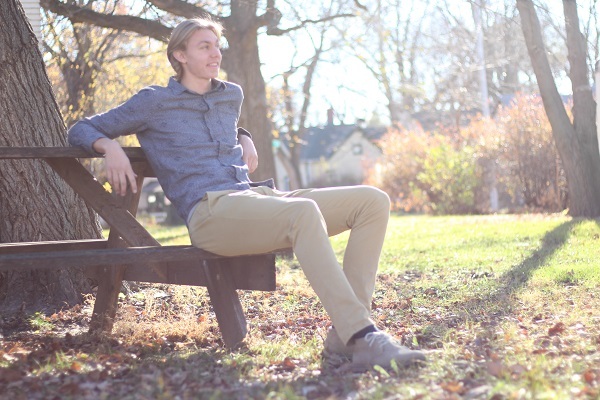 Help me overcome my unbelief.” It’s the conversation with God that proclaims, “I can’t do this alone. But I trust that I can do it with You.” And it’s the surrendered heart’s cry ready to welcome the true love, peace, and joy that can only be provided by our perfect Father. I continue to learn that if I want to live in the fullness of His peace, I have no choice but to completely trust God with my kids. I meet Him each morning in the quiet, while all of the house is still sleeping. 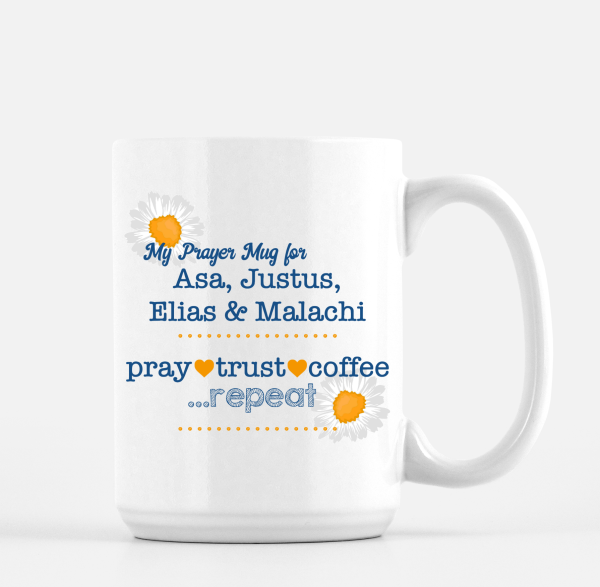 I wake up with coffee and Jesus, choosing a different colored mug to fill each day, praying specifically for my kids, as each mug directly represents one of my four sons. I drink in the goodness, I fill up with Truth, and I learn day after day to more fully let go of self and embrace the promises of God for my family. On this, your 20th birthday, I say thank you. Thank you for teaching me to pray. I’m honored today to dedicate my newest book to you. I wrote it because of you…because of you and your brothers. Asa, Justus, Elias, and Malachi – thank you for teaching me to look to our Savior as I strive to fully trust His goodness for our lives. 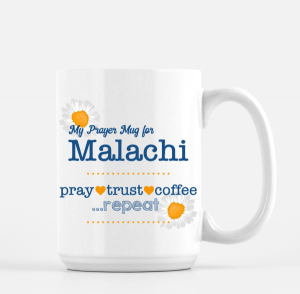 It is with great joy that I introduce you to The Prayer Mugs. It is a book filled with scripture truth and parenting encouragement. Throughout its 96 pages, you’ll get to walk with me as I share precious pieces of the past 20 years of my parenting journey – the journey that is teaching me the truth about God’s faithfulness in our lives. You can be sure that the pages of this book are lovingly stained with coffee and tears. I’m guessing you’ll find a chuckle here and there. Most importantly, my hope is that this book will land you in a place of peace as you spend time praying for your children and learn more about all God has to offer our families through His word and His promises. 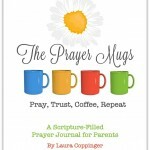 The Prayer Mugs includes 96 pages with 10 detailed “Prayer Mug Lessons.” It’s full of our stories. It’s full of scripture and study questions. It’s full of specific prayer guides. It’s full of beautifully designed scripture printables. You’ll read. You’ll dig into the Word. You’ll journal (if that’s your thing). You’ll pray, you’ll pray, you’ll pray. You will love this glorious time with God and you can be sure that your life as a parent will be changed. It’s the kind of change that is not to be feared, but rather embraced, as time in the Word and in prayer set us free and fill us all with hope and joy! 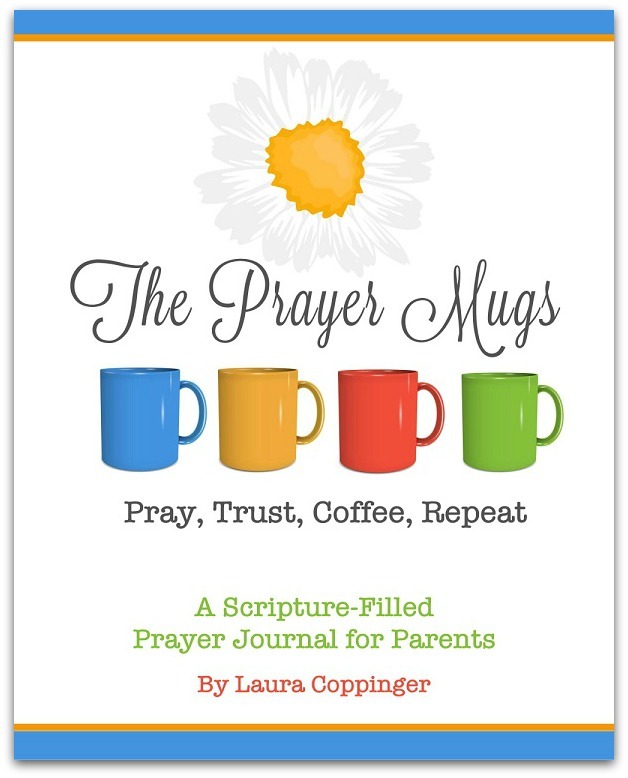 Snag and download your copy of The Prayer Mugs. Grab your Bible. Fill your mug. Drink in the good and perfect promises of God. Release all parenting burdens and joyfully grab hold of Truth as you perfect the art of trusting the Father with your kids’ hearts and lives. P.P.S. This book is for parents of kids from newborn to adult. Once a parent, always a parent. May we always and forever pray for our children in full faith that God is absolutely at work in their lives. Aha! Good question. The answer is that any mugs will work – any cups that carry a special link to your child(ren). But I’m excited to announce that you can now order these personalized mugs! I MUST HAVE THIS. Beautiful! Reaping the fruits of your labors! And I am gonna GET THIS E-BOOK TODAY!! (Sorry for the “shouting,” everybody.) I have gotten SO much from your godly wisdom, parenting stories, humor, cooking advice,, recipes, great way with words, and so much more over the year-plus that I’ve had you as our Home page on every device! Thank you very, very much!! Plus—my wonderful Husband and I are finally getting serious about praying for our precious children in a disciplined/regular/together-at-the-same-time kind of way, and this will be perfect! Laura, great idea on the book and on the color-coded mugs! Would you mind sharing where you found your mugs? 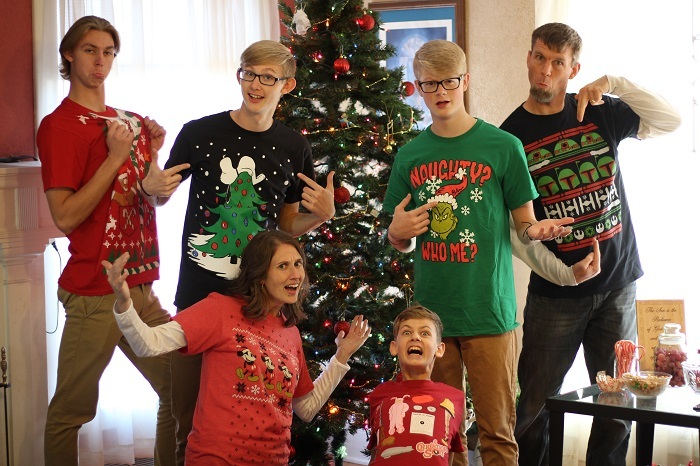 We got them at Wal-mart at Christmastime a few years ago. But others have asked too, so I need to do some searching to find good options for people! These are okay: https://www.amazon.com/gp/product/B013YQNXRS?ie=UTF8&tag=wwwheavenlyho-20&camp=1789&linkCode=xm2&creativeASIN=B013YQNXRS but I think we could find something better. Or maybe each mug is completely different – personal to each of your kids!